The T2 hull mostly resembles canoes found in the Marshall Islands and nearby Kiribati, and at 18', would be used primarily for fishing and transportation within an atoll lagoon. 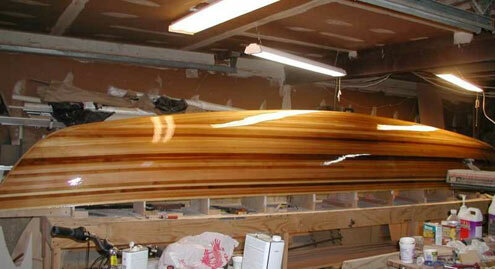 The hull is a deep rounded vee with an asymmetric shape and is constructed with the strip composite method. Each end of the hull is identical and it is sailed with either end as the bow. The ama is always kept on the windward side and can be flown above the water to reduce drag. The T2 can be sailed with either the classic Oceanic lateen rig or a modification of a rig developed by Euell Gibbons in the 1950s. 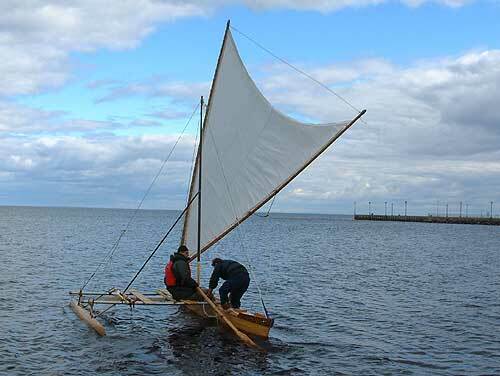 The Oceanic lateen rig (below) is very old but still very powerful. If you are an experienced sailor, you will have to develop some new instincts when handling it. It is very forgiving of incorrect sheeting angles, and will maintain its power at a point where a more conventional rig would have stalled. 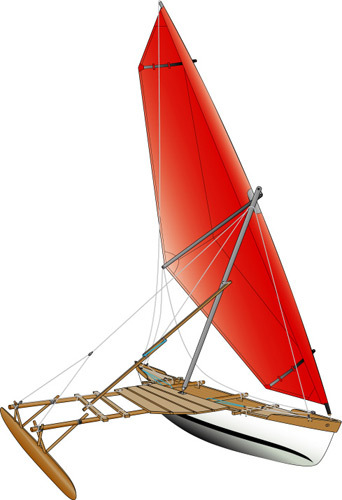 The Gibbons rig (shown above) is completely untraditional with its roots in windsurfing, and will appeal to the sailor who is interested in high speed. My version of the Gibbons rig is still experimental and you won’t see many of them around, but it is worth the time and effort if you enjoy developing new technology. The T2 is a sport canoe for one or two people, and is not designed to carry heavy loads. The cockpit has a floor above the waterline which allows it to be self draining. Watertight bulkheads in each end, combined with the sealed area below the cockpit, allow it to be sailed in extreme conditions without any concern for how much water enters. Seating is provided on a platform over the windward side, supported by the iakos. Because you will always be sitting on the windward side, there is no need to change sides when changing direction during a shunt. 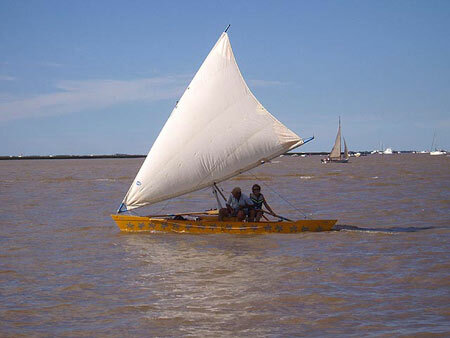 A steering oar is the recommended way to steer, and can be used to scull the canoe when becalmed. 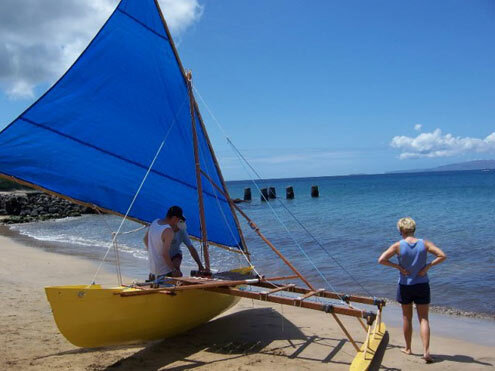 The fore and aft position of crew weight has a great effect on the steering and can be used to avoid use of the steering oar on all points of sail except for a broad reach or run. The asymmetric deep vee hull shape requires no foils or leeboard for lateral resistance. The lack of underwater foils reduces the windward performance only marginally, and can give great confidence when sailing fast in shallow water. 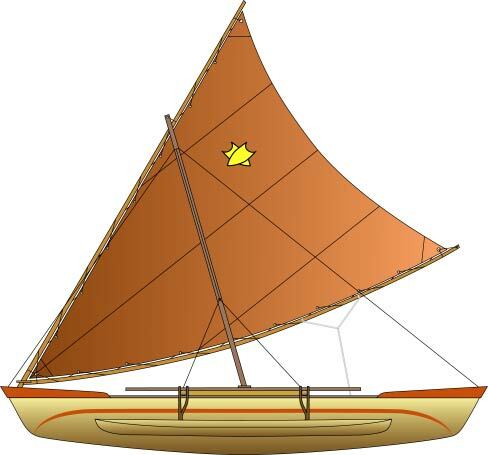 The asymmetric hull helps to counteract the forces of the long boomed lateen sail and the ama drag that try to turn the canoe into the wind.